Reviews of the best rice cooker slow cooker models including units from Sanyo, Panasonic, Zojirushi, and Cuisinart. Each unit receives a majority of positive feedback and yeilds very good quality rice and slow-cooked dishes. This rice cooker slow cooker combo is what we believe to be one of the best models on this page as it not only performs well in both areas, but also receives a large amount of positive 4 and 5 Star customer reviews (on Amazon.com & Cooking.com). For making rice, the unit offers settings for white rice, sushi, mixed rice, brown rice, rinse free, and a quick cook option (lowered quality). The Sanyo ECJ-HC100S uses fuzzy logic technology when cooking rice and will monitor how the selected variety is cooking by making slight temperature adjustments along the way resulting in an above standard high quality batch of rice. For slow cooking, the unit comes with a separate titanium-coated bowl and offers folks both a high and low temperature setting with a maximum cook time of 12 hours. This is a 10 cup rice cooker slow cooker appliance which will prepare up to 30 cups of cooked white rice and has an approx. 3 3/4 quart bowl capacity for slow cooking. There is also a smaller 5.5 cup version as well. As Zojirushi’s newest model, the Umami cooker is their first to offer a slow cooking feature. The unit comes available in both a 5.5 and 10 cup capacity and allows the user to prepare high quality white, mixed, sushi, or brown rice dishes using the internal rice cooking monitoring technology. Folks also have the option to use this as a slow cooker for preparing soups and stews. However, at this present time we are not sure of the total slow cook times this newer model offers. It does receive a large majority of 5 Star reviews and although expensive holds true to the Zojirushi trusted quality. Like the above Sanyo, this Panasonic rice cooker and slow cooker model is yet another great unit to consider when preferring a machine that acts more than just a rice cooker and providing several purposes. 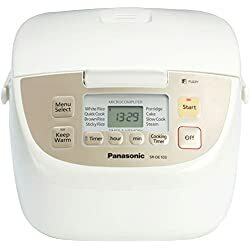 The Panasonic SR-MS103 has a 5.5 bowl capacity that will yield around 16 cups or so of cooked rice and is good for a total capacity of approx. 1 liter when using for slow cooking stews or soups with a minimum of 1 hours and a maximum cook time of 12 hours. Rice quality is of a very good standard whether folks wish to prepare white or brown rice and will use fuzzy logic technology for ensuring an evenly well-cooked batch complete with consistency after each use. 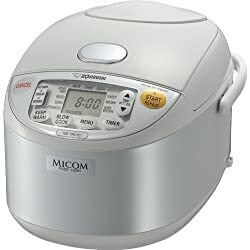 For the medium price online, it is another good option to research for those who want the advanced settings of a good rice cooker along with the benefits of a Crock pot. There are also food steaming features with this unit as well. 10 Cup version available. Other good rice cooker slow cooker recommendations we have are those made from Cuisinart and Aroma. The Cuisinart FRC-800 has settings for making rice that produces high quality results along with a slow cooking setting good for making soups & stews. However, the FRC-800 is more of a “fast” slow cooker since we discovered the total maximum slow cook time is only 2 hours. Technically, this is not really a slow cooker, and is more of an electric “pot”. Either way, for the price it is a good appliance to consider . As for Aroma, it too has several models with multiple rice settings and uses a form of monitoring technology for better textured rice dishes along with some that have slow cook modes. But at the time of this writing, it appears one particular model that comes the closest to a rice cooker and slow cooker combo is to be discontinued soon, so supplies may be limited. You can read our full Aroma Cooker reviews here. Currently, these are the best rice cooker slow cooker units we have come across when comparing price, quality, and performance.